Hogs Back - Winter Ale 4.40 But a little chilly but it was first one out ! Andrew and I had taken a bit of a wrong turning getting here and ended up in some dead end lanes. This is an oddly modernised small village pub. The lounge bar has a flat screen TV and lots of light wood. There is also a restaurant area and looks as if the pub supports the local cricket team too. I have to admit, not my favourite pub on this tour. Westerham - God's Wallop (see now 4% entry) 4.50 Still a bit sticky on the malt and not a lot of hop character. 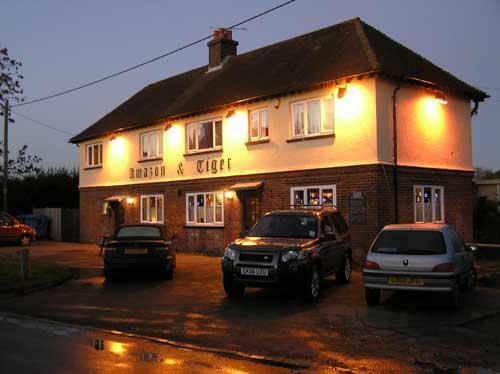 The pub is found in Harvel, Kent, DA13 0DE. A large multiroomed put with plenty of seating. Lots of pine funtiture and bare brick walls. We have visited this pub 4 times, seen 10 different beers and tried 4 of them.